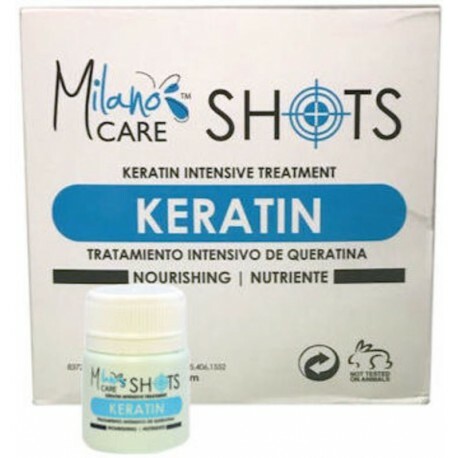 Milano Care Shots Keratin Intensive Treatment (12 shots 1.69oz each) - Just Beauty Products, Inc.
Milano Care Shots Keratin Intensive Treatment: This nourishing hydrolyzed keratin treatment, for dry and slightly damage hair. Contains wheat and rice to nourish and repair fiber, bringing it back to its optimal hydration and conditioning level. How to use: Apply the treatment to towel-dried hair, distribute venly, massage and comb through hair. Leave on for 5 - 15 mins. NO NEED TO RINSE. Style as desired.. Ingredients: Aqua, Cetrimonium Chloride, Cetyl Alcohol, Glycerin, Methyl Paraben, Propyl Paraben, Cetearyl Alcohol, Dimethicone Copolyol, Amodimethicone, Petrolatum, Propylene Glycol, Hydroxypropyltrimonium Honey, Aqua/Water-Hydrolized Algae Extract, Hydrolyzed Wheat Protein, Keratin, Hydrolyzed Rice Protein, Panthenol, Benzophenone 4, Citric Acid, Methyldibromo Glutaronitrile/MMethylchloroisothiazolinone/Phenoxyethanol, Parfum. May Contain: CI 19140, CI 42090, CI 4538.